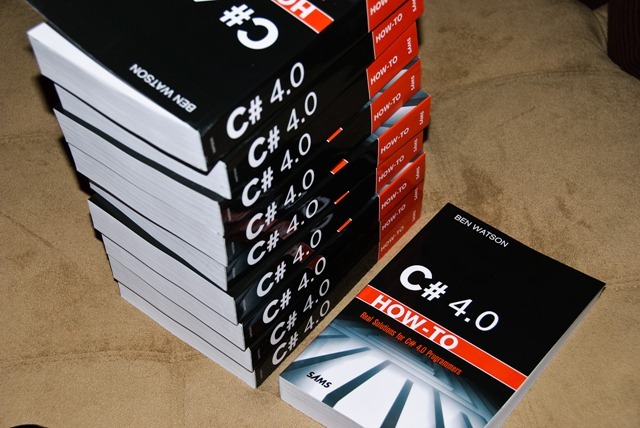 InformIT has just published an interview with me where they asked me a bunch of questions related to C# 4.0 How-To. We got into the multicore future, Internet versus books, why C# programmers need to know about UAC, and a lot more. Check it out! This entry was posted in Books, Link/News, Personal, Software Development, Thoughts On Tech and More on March 19, 2010 by Ben. This entry was posted in Books, Personal on March 9, 2010 by Ben. I recently wandered into a thrift store and as is usual in these stores I headed to the book section. (I live by the maxim that you can never own too many books.) The only thing that really caught my eye was a hardcover edition of The Code Book: The Science of Secrecy from Ancient Egypt to Quantum Cryptography by Simon Singh. A quick perusal indicated it would be worth the shelf space. However, I severely underestimated how much I would enjoy this book. I’m about half way through and find it so interesting and compelling a read that I feel I have to write about it. The thing that really strikes me about this book is how entertaining and readable it is. I am not a big crypto or security guru, so I came to this book largely ignorant of of the topics and history. The book is a wonderful blend of how encryption works with the history that surrounded its development. For such a seemingly-complex topic, Singh seems to have hit the perfect blend of history and instruction. Starting with the rudimentary Caesarian ciphers (basically, letter substitution) he builds up the techniques in the millenia-old one-upsmanship game between those who encipher and those who attempt to decipher. He starts with frequency analysis and history progresses he builds upon the previous techniques in explaining ever-more sophisticated attacks. And let me be clear—he will teach you exactly how Enigma worked! It’s not that complicated, once you understand the principles that came before it. Similarly, he explains how first the Polish and then the British cracked the Enigma as it evolved from the 1930’s to the end of the war, the mistakes the Germans made, and the things that, for example, the German Navy did to increase the security of it so that it became essentially unbreakable without external help (i.e., finding a codebook). He discusses the Navajo code talkers (there is more to it than simply speaking an obscure language! ), public key security, and finally quantum computing. If you enjoy computer security topics, history, or just like to geek out, this is a great book to read. Coincidentally, Simon Singh is also at the center of an unfortunate controversy in the UK surrounding some (I believe justified) comments he made about the British Chiropractic Association’s practices of encouraging procedures that could be considered unsafe. Rather than defend the practices with facts, they have decided to sue him for libel (the UK is infamous for having draconian libel laws that strongly favor accusers). You can learn more at his website. You can also read a thorough explanation of the events at the Bad Astronomy blog. This entry was posted in Books on November 3, 2009 by Ben. 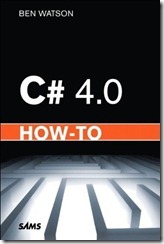 C# 4.0 How-To now available for pre-sale! Various ways of rounding, including “snapping” to specific intervals. …and hundreds of other topics, covering everything from the basics of C# to WPF, ASP.Net, interaction with the operating system, common application patterns and more. I cover all the new stuff that’s in both the C# language and the .Net 4 framework classes, as well as existing functionality. Each topic begins with a brief description of when/where/why you would need to use the technique, followed by a brief explanation and source code. I often just want a reference I can quickly dive into to remind me of how something is done. This book is my attempt to put in writing what I find valuable, both when I was learning C# and now when I just need to locate a sample quickly. Over the next few months I’ll talk more about what’s in the book, and hopefully get back into blogging more programming topics. 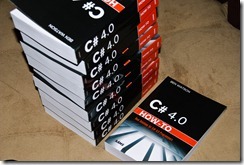 This entry was posted in Books, Personal and tagged .net, C# on October 15, 2009 by Ben. Review: Pragmatic Unit Testing in C# with NUnit, 2nd Ed. I saw this book when I bought Programming WPF a few weeks ago and it looked promising enough to buy. I’ve been doing unit testing in C# for a few years now, but I thought there were always things to learn and maybe I’d pick up a few new ideas. It is easy to contrast this book with Beck’s Test Driven Development: By Example , and the two books definitely have a very different feel. Beck’s book has a very evangelical feel to it, and it’s main purpose is to teach a mind set more than technical details. I believe this is important–maybe of first importance–but once you understand that, the rest of the book is a little simplistic for more experienced developers. There are also good discussions of more mundane issues like how to deploy NUnit, where to put tests in a project, team practices, GUIs, threading, and C#-specific issues. The discussion about mock objects (a very basic introduction) is also quite clear and understandable–more so than many resources I’ve seen on the web, which often assume you already know all about them. Something I don’t like: the acronyms (BICEP, CORRECT, A TRIP). They kind of bug me. I like the ideas behind the acronyms and I think it’s more important and effective (for me, anyway) to internalize the principles of testing rather than remembering specific acronyms and the words they go with. YMMV. I will probably only read Test Drive Development: By Example once, but I will definitely come back to Pragmatic Unit Testing occasionally to refresh my ideas. This entry was posted in Books, Software Development and tagged .net, Books, programming, unit testing on June 4, 2008 by Ben. Well, after a week of investigation, I’ve settled on a social network for books: Shelfari. It’s attractive, easy-to-use, easy to manipulate many books at once, they have a mobile version, and I have one friend on it (who invited me). Goodreads.com also looked nice, and it almost won. bookwormr.com, the one I originally found was just too immature at this point. I’m also wondering what features are going to set it apart from the pack, especially when there are so many well-established sites that do the same thing. Meanwhile, if you want to read some books that will definitely NOT make you smarter, check out 5 Books that can actually make you stupider. This entry was posted in Books, Link/News and tagged Books, Humor on February 29, 2008 by Ben. I found a great site I wanted to share with everybody: bookwormr. Scotland: The Story of a Nation – Magnus Magnusson – Much of my heritage is Scottish, and I got intensely interested in Scottish history during our trip to Edinburgh last year. Code Complete – Steve McConnell – I’ve read this before, but it’s a good book to review every year or so and pick up new tips. The Complete Grimm’s Fairy Tales – there are many variations on this book. I have a very old, out-of-print edition. I read a few of these a week–they’re mostly quite short. Those are all fairly large books and I’ve been working on them simultaneously. Meanwhile, I keep getting book recommendations from various places (blogs, podcasts, family). It’s to the point where if I don’t write them down, I’ll forget. I’ve sort-of kept track of books I want to read on my shelf, in an Outlook note, in e-mails to myself, but I was in need of a central repository for this. So I stumbled upon bookwormr, which is (almost) exactly what I want. It’s still in its infancy stages, but I think it shows great promise. And it is usable now, despite some rough edges. The owner seems very amenable to suggestions via the blog. You can tag, review, and rate the books. See what others are reading. The author also has a wordpress plug-in and a Facebook app to go along with it. I’m going to try out both. Update: here’s my bookwormr profile. This entry was posted in Books, Link/News and tagged Books on February 20, 2008 by Ben. Even if the Internet connection goes out, your computer does not become a dumb brick. There were days these last few days where I didn’t bother turning it on. Then I realized all the things I could still do. Organize photos in Picasa – I have nearly 6,000 photos on my computer. Many of them need to be deleted, organized, tagged, labeled, e-mailed, etc. (Yes, e-mailed–I can queue them in Outlook until the connection comes back). Organize My Documents – I’ve let My Documents folder get very messy. Lots of files that don’t need to be there anymore. Others need to be filed, or re-filed. Organize e-mail – I’ve got hundreds of folders in Outlook. I’ve tried to keep my Inbox empty and put things into @Action, @Someday, or @WaitingFor folders before they find a permanent home, but sometimes it still gets out of hand. Program. I’ve got two major programming projects I’m working on. They don’t depend on the Internet. The Internet is NICE if you need to learn something, but there’s always plenty of stuff to do that doesn’t require it. Write unit tests, run code coverage, design graphics, do all the other stuff if you must. Write e-mails to family. Long ones. Your mom will thank you. Catch up on podcasts. I got through ten episodes of Ask a Ninja, and nearly all backlogged podcasts. Now I’ll have a flood when I sync tonight. Write blog entries. I use Windows Live Writer. I should have done more of this. Setup appointments and events in Outlook for the next year. Read some classic programming texts. General computer maintenance. Defrag your disk, delete temp files, delete old installation files you haven’t used in 5 years (yes, I have some of those…). Use DiskSlicer to find where your space is going. Do long-avoided projects. I have approximately 20 hours of audio I need to edit and split into tracks. I’ve been putting it off for a very long time. Read books. I’ve just started Cryptonomicon by Neal Stephenson. Very good, so far. Go buy it. If you’re a geek, you’ll like it. How can you not love a 2 page diversion into the mathematics of when a bike chain will interfere with a broken spoke and fall off? Other than the geekiness, it’s a good story. Or just go to the library and use the Internet. I only did this a few times, despite it being within walking distance from where I live. This entry was posted in Books, Tips and tagged blogging, Books, email, games, google, internet, music, organization, outlook, podcasts, software, Tips on December 14, 2007 by Ben.